Latest version of the new generation French antivirus. VirusKeeper is a simple, fast and effective antivirus. VirusKeeper provides complete PC protection against current threats. 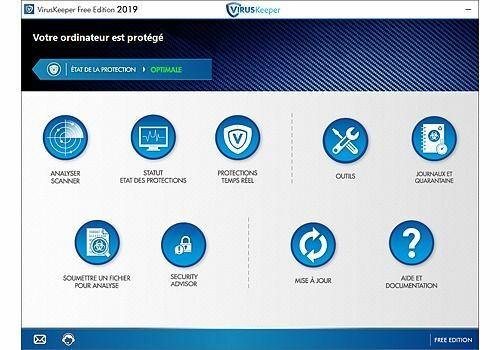 VirusKeeper 2019 Free Edition is the latest version of the French antivirus / antispyware software VirusKeeper. VirusKeeper is a complete antivirus / antispyware software for Windows that integrates the best current protection technologies. It is a real-time shield with behavioral analysis. It automatically scans suspicious files and is designed to be both accessible and fast in the detection and removal of malicious objects. Here are the other features that antivirus offers: protection of Windows system files, protection of the web browser with "Back Door Detect" technology to automatically detect any backdoor, an advanced analysis tool ProcessWatch : to analyze all programs active in memory and finally a NetWatch network analysis tool to identify all programs that communicate on the network or on the Internet with a single click. VirusKeeper 2018 provides a high level of protection against current threats. As with previous versions, VirusKeeper integrates on a real-time analysis engine that constantly monitors and protects the PC from viruses (known or unknown) and spyware (spyware). 27 million users worldwide trust VirusKeeper. A complete antivirus and antispyware software, which includes many modules adapted to new threats on the Internet. Note the behavioral analysis module, the protection of Windows system files and Internet Explorer, the real-time Messenger protection and the NetWatch tool to identify programs that communicate on the Internet, the software has the particularity of using few memory/CPU resources and does not slow down the computer. Removes Yieldmanager adware - get rid of annoying ads and toolbar in one click using this automatic deletion tool.